The Furniture Loft announces it's new site. The original brief for this project was a simple, elegant site to highlight and raise awareness of their new business. We just needed to fulfil the 3 most important factors for any business today; Who Are We, Where Are We and What Do We Do. Sleek, clean and most of all tidy. Easy to manage and maintain. Flexible enough to be able to represent products in a variety of collections. From the outset, mobile friendly, responsive design was foremost in the brief. Happily, the PG54 Content Management System produces responsive layouts by default so little time needs to be spent adapting designs or layouts to achieve this crucial ability. Secondly, Furniture Loft wanted to achieve a modern, contemporary, uncluttered design, leading naturally to the furniture being the star of the page rather than other, potentially distracting elements. Together, we came up with the design and layout you see today and we're both quite proud of the results. 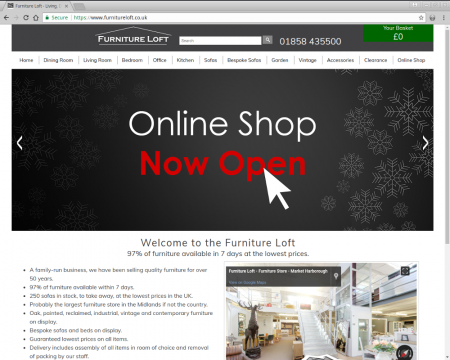 Finally, we have been asked to add a full e-commerce solution so that The Furniture Loft can begin to trade on-line as easily as they do off-line in their two significant retail stores. This is yet another great example of just how almost any project is never a done deal and requires constant attention and adjustment to keep pace with the ever changing trends and demands of the internet.